Would your cats enjoy playing with this Cat Tunnel (on sale) on Amazon? Hurry and get the isYoung Cat Tunnel Play Tube, Collapsible 3 Way Play Toy with Peek Hole and 3 Toy Ball – Playing Tunnel for Kitten, Rabbits and Small Dogs today for only $39.99 just $7.99 from Amazon when you use promo code VSFPJIK3 at checkout! Check out all of the recent Amazon deals here! 3 Tunnels provides your cat a good place to hide or play, Provides hours of exercise & self-amusement. A great way to encourage daily exercise – Some times you have to left your fur-friend at home along while working, but with this cat tunnel, they will not feel alont anymore. Made of an ultra-strong, tear-resistant polyester wrapped around a sprung-steel, frame with protective ends (for safety). Easy to store – isYoung cat tunnel can be fold in secondes with it’s sprung-steel frame. Take the entertainment with you anywhere, so your pet is never bored! Give your cat hours of entertainment and exercise with this fun, collapsible 3-way cat tunnel. Featuring a variety of “bells & crackling paper,” it’s the purr-fect playground for high-energy felines! Short Plush Material: softer and more comfortable than other tunnels in the market. Great Ventilation: one vent on the top so that cats can freely get in and out of the tunnel. Meanwhile they can have better interaction with you and the environment. Foldable Design : it can be folded to save space at your home. Bigger Diameter：This tunnel is no only ideal for big weighted cats but also for cats that may be tall or long. A great Christmas or birthday gift for cats & their owners! 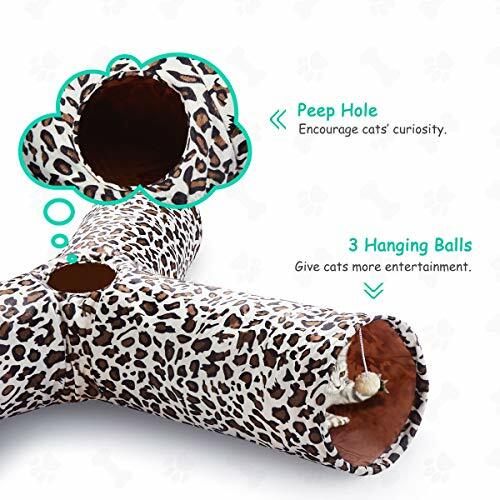 Buy the isYoung Cat Tunnel Play Tube, Collapsible 3 Way Play Toy with Peek Hole and 3 Toy Ball – Playing Tunnel for Kitten, Rabbits and Small Dogs from Amazon.